The blue flower on the left is crocheted with Red Heart Stardust superfine yarn. It measures about 2.25 inches/5.72 cm across. The peachy-pink flower is crocheted with a laceweight/fine acrylic yarn (18wpi) and it has a diameter of about 2.75 inches/6.99 cm. 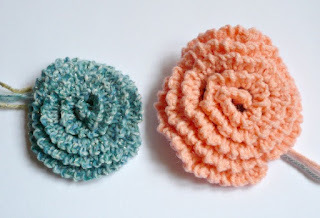 For both flowers, I used a Clover Soft Touch crochet hook size #3 ( 2.25mm). 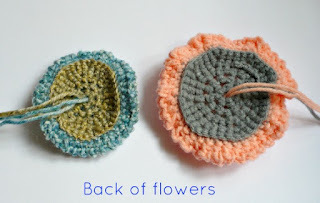 (You can crochet the whole flower in one color if you prerfer). Start with the contrasting color yarn for the base disc of the flower. Use a stitch marker to mark rnds. 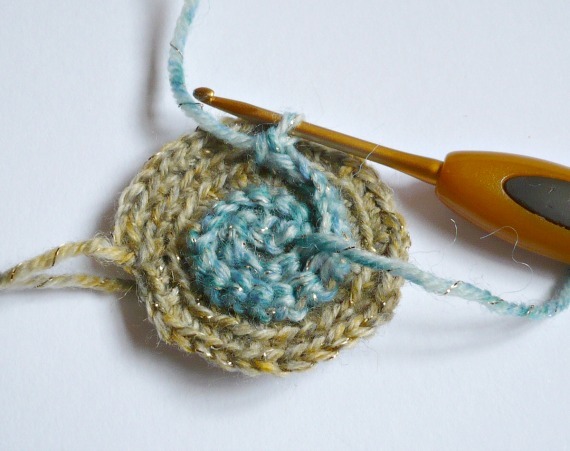 From rnd 2 to rnd 5, crochet in back loops only. 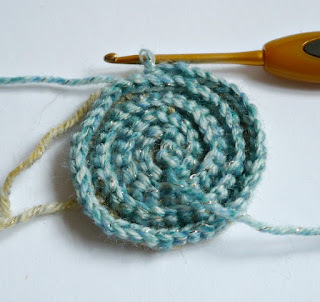 At the end of rnd 5, sl st to top of beginning sc and fasten off yarn. Weave in ends. 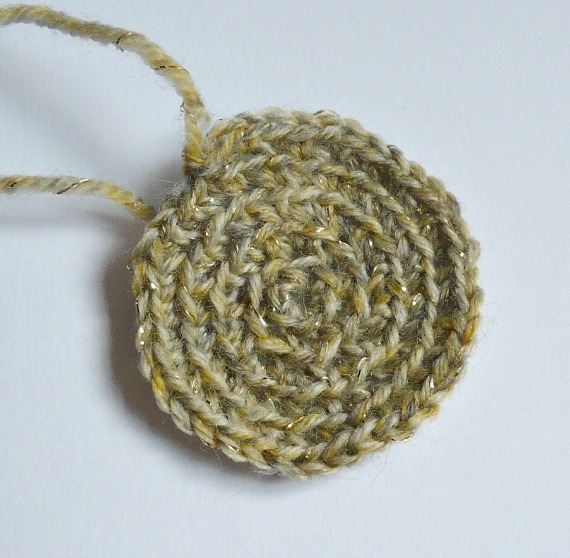 Join main color yarn to the centre of the flower with a slip knot, on the first front loop. Ch 1 and sc in the same first front loop and in each front loop around. You are actually working in a spiral. At the end of the spiral, ch 2 and turn your work to the back side. Sc in first sc. [Ch 2, sc in next sc] repeat around. I hope that you will enjoy this pattern! :) All comments and questions are most welcome! Thank you for a great pattern! I found your blog this evening and have already made a flower. 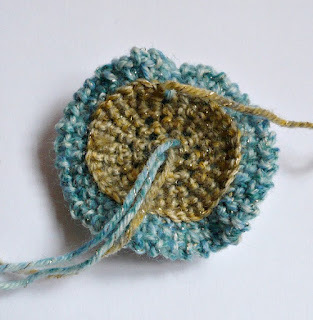 I am thinking I need to make another one and add them to a pair of slippers. Thank you again! I forgot to mention in my pattern that you can add buttons or beads to the centre of the flowers :) Thanks Tracie for your comments! I really appreciate your feedback! Just the pattern I was looking for. Made this today to match a little purse I made last night. Looks awesome. Thank you for the free pattern. Love that you made this flower, Teresa :) Thanks so much for writing and hope you can make more of these beauties for your other projects! 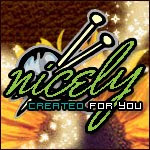 The flower looks beautiful and I was SHOCKED to see that you were offering the pattern to us for free! Thank you so much. And your blog/Pinterest collection look like a LOT of fun too. Hiya, thanks so much for your kind words :) Offering free patterns is my way of giving back to each and everyone who has been encouraging and inspiring and to those who have also contributed free tutorials etc... and I really enjoy the online interactions with nice people like you! 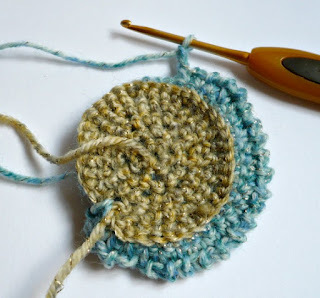 Thank you for the beautiful pattern....can you sew them together to make a rug? Thank you Jean :) So far, I've only made these flowers into brooches and also attach them onto bags. Not sure about making a rug though. Will need to crochet them using thicker yarn for a rug. Thank you so much for the pattern. Can't wait to try it.